The FCC just voted to end net neutrality—breaking the fundamental principle of the open Internet—but Congress can use the "Congressional Review Act" to overrule the FCC. To get them to do it, "Break the Internet" on your site, with your profile picture, on Twitter, Facebook, Snapchat, Instagram, LinkedIn, reddit, Tumblr, Youtube or in whatever wild creative way you can to get your audience to contact Congress. That’s how we win. Are you in? Net neutrality affects everyone who uses the Internet. This protest is for all of us. Here’s a big list of creative ways to “Break the Internet” for the 48 hours before the FCC vote. Go wild and Tweet every 10 minutes today, change your job on LinkedIn to “Defending Net Neutrality” or say you’re “Married to the Open Internet” on Facebook. Do whatever you can to get *everyone’s* attention and drive phone calls to Congress. If you run a website or blog, go here. Use the image below or Click here. Use these materials to post a story, or post these graphics frequently until the vote. Change your featured website to battleforthenet.com. Save this photo and upload it to your Snapchat story. 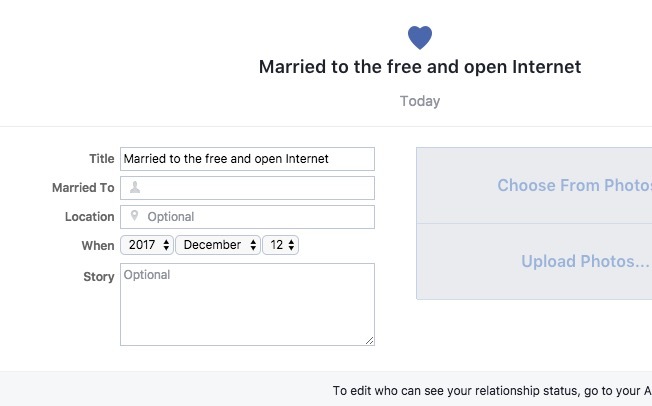 “Break the Internet” and get everyone’s attention by changing your “Relationship Status.” Get “Married” (to the free and open Internet). Share the status and then immediately add a comment sending people to take action at battleforthenet.com. 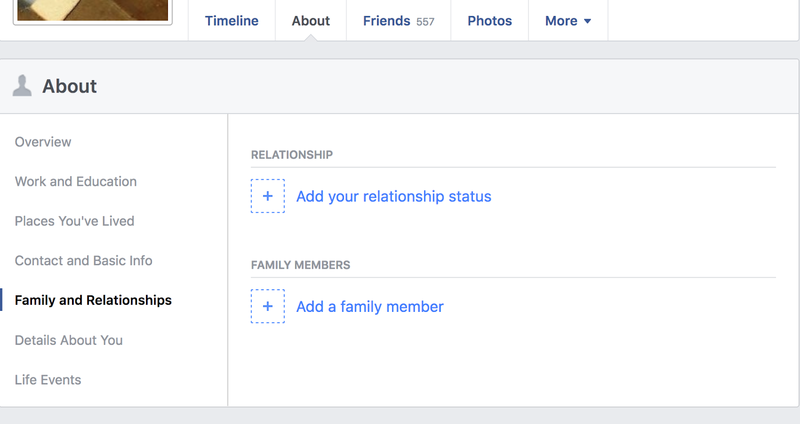 a) Go to “About” section of your Facebook page and choose “Family and Relationships” in the left sidebar. Add a relationship status and choose "Married" and hit “Save Changes”. b) From the top right of the post click on "edit life event". Change the Title to "Free and Open Internet" or "Net Neutrality". 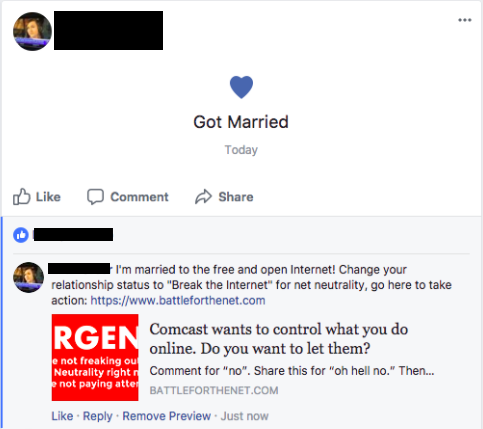 c) Share it and add a comment to the post that says: "I'm married to the free and open Internet! Go to https://www.battleforthenet.com to help defend net neutrality. Change your relationship status to get everyone’s attention. Get involved at https://www.breaktheinternetprotest.org!" Just follow these step-by-step instructions to add a "Contact Congress" widget to your Tumblr. 1. 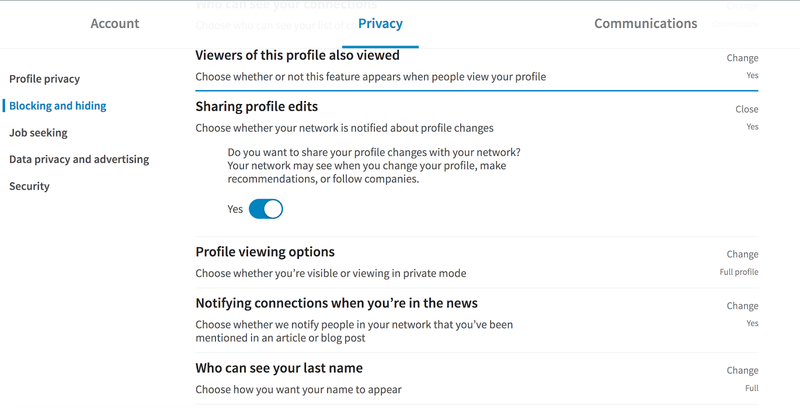 Make sure your settings are set to: “notify people when your profile changes”. Go to the upper right hand corner, choose settings and go to the Privacy tab. Make sure you choose yes on “Sharing profile edits”. “The FCC is voting to end net neutrality on Dec. 14th. Congress can still stop the vote, but only if we make them. 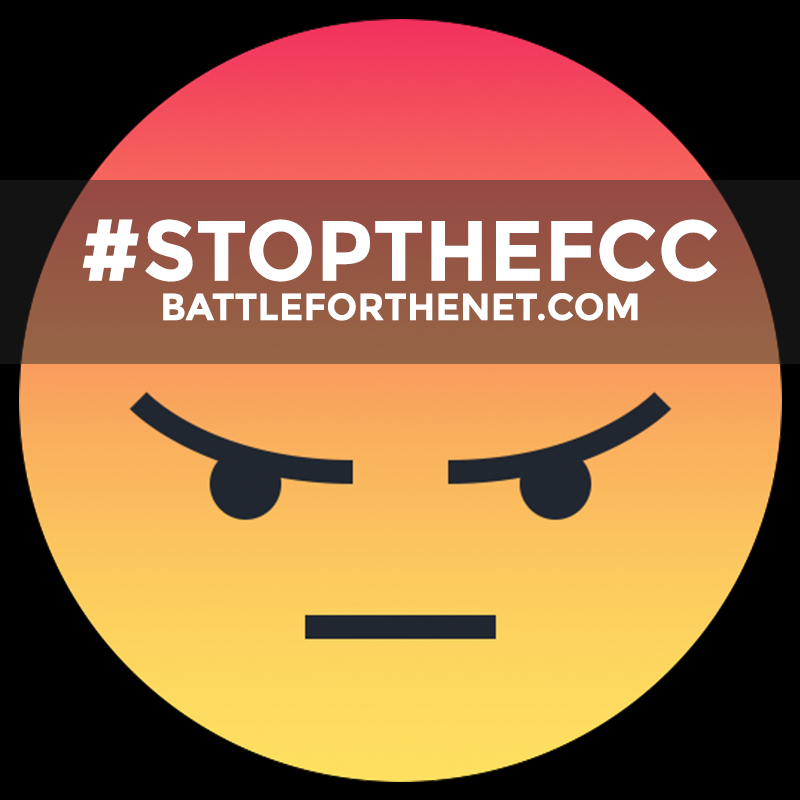 Go to https://www.battleforthenet.com to #StoptheFCC and defend net neutrality before it's too late. Let’s do another community takeover! 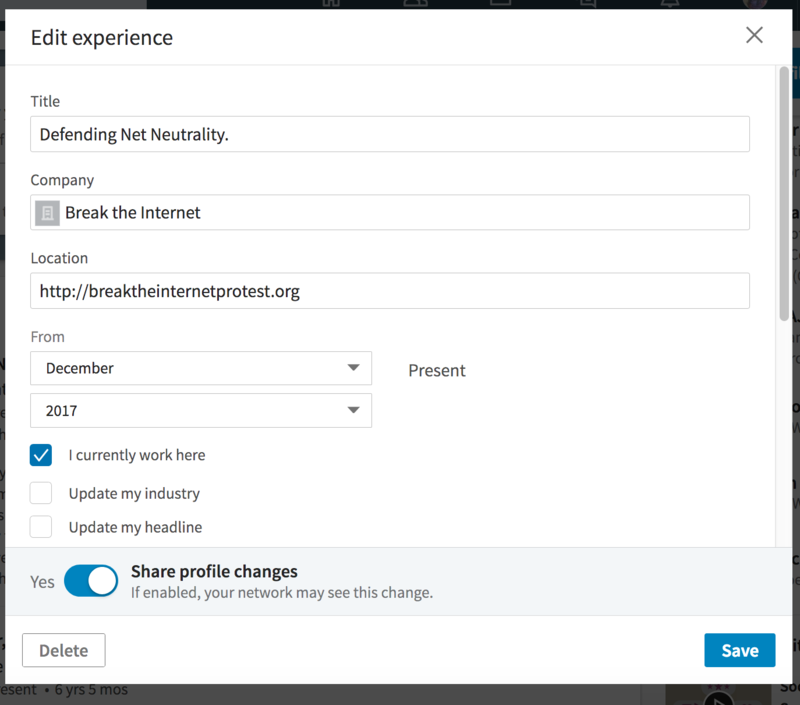 Everyone post links to https://www.battleforthenet.com and https://www.breaktheinternetprotest.org -- get wild and creative. If you’re a mod, check this thread with CSS you can use to change your theme and “break” your subreddit. 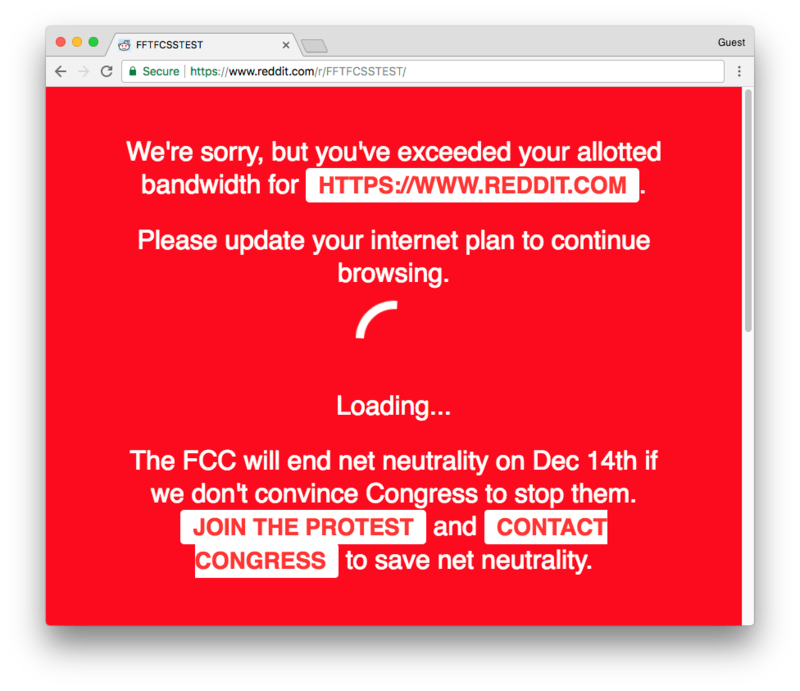 You can display a prominent alert on your site that shows the world what the web will look like without net neutrality, and asks your visitors to call Congress. Click here for a demo, grab the code on GitHub, or check out these instructions for Tumblr. None of these will actually block, slow, or paywall your site. But, they will let your users contact their representatives in Congress without having to leave your page. They appear once per user per day and users can easily click away. You can even participate on YouTube and Vimeo with this video bumper. We made a short video reel that explains why net neutrality matters, and how Internet users can tell the FCC and Congress to protect the open web at all costs through BattleForTheNet.com. Add this reel to your online creations starting now. Tell your viewers about the day of action on YouTube, Vimeo, or wherever else you put your videos! Sign up with your email and we'll send you instructions on how to take action and urgent updates leading into the day of action. Forward this to your friends for maximum impact! I have a large online audience, or a friend or employer who does. Tweet messages like these every day! Thanks! Now, can you get others to join, before the FCC vote? Now, one of the most impactful things you can do to help save net neutrality before Dec. 14th is to make phone calls to Congress. If offices get more phone calls from constituents, we can persuade them to stop the catastrophic plan to repeal net neutrality. We will connect you to the offices of your lawmakers. "I support 'Title Two' net neutrality rules and I urge you to oppose the FCC's plan to repeal them. Specifically, I'd like you to contact the FCC Chairman and demand he abandon his current plan."